It feels a little like groundhog day – I find myself sitting here looking for new prose to describe the same thing: 360 prices continue to rise in the wake of unrelenting demand. 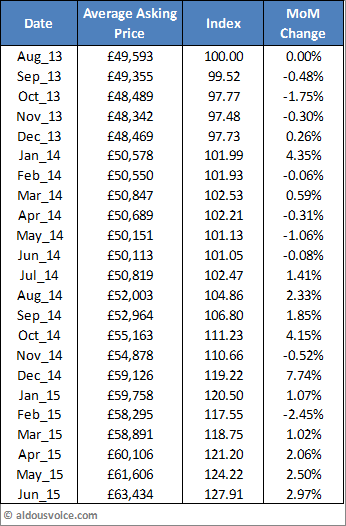 The average asking price has risen 2.97% over the last month which leaves the price index at 127.91. That’s more than a 25% increase in the last year and nearly 30% from the depths of winter 2013 (the last time there was any meaningful fall in prices). All the lower priced cars seem to have been taken off the market and prices now start at £50k – which doesn’t even buy you a particularity nice car these days. A few years back these cars would have been selling for low £30k’s (which incidentally would only buy you the well used Silverstone cars now, all of which have been sold). 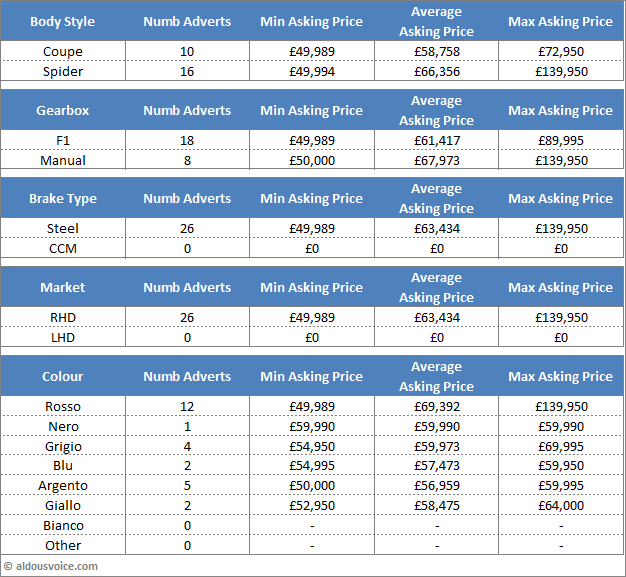 Activity in the run up to the start of summer remains robust with 19 cars sold and just 11 replacing them. 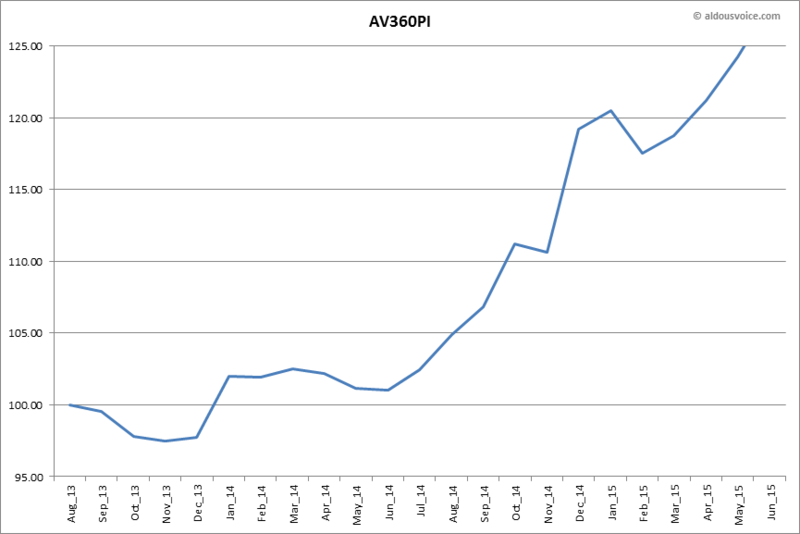 The number of cars for sale is at its lowest since I started collecting data, a trend which is repeated with other tipos (people tend to be holding onto their cars). 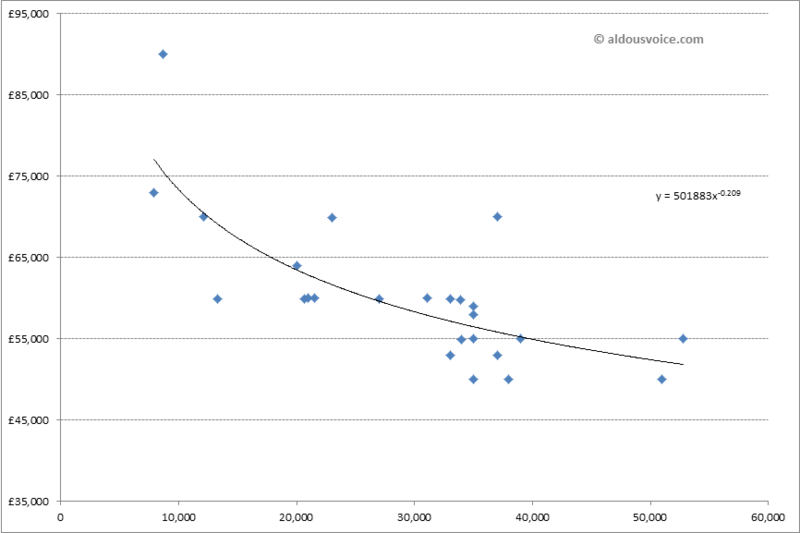 And here’s the plot of price vs mileage. 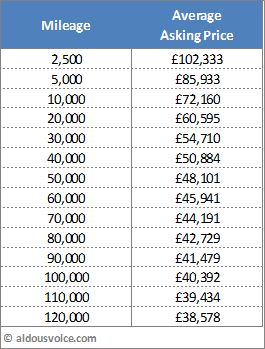 Note that I have taken out the ridiculously priced spider at £139k as it skews the chart. Unsurprisingly this hasn’t sold (if anyone has been to see it please drop me a line – I be interested to hear about the car). Prices seem to be fitting the line very well, with few outliers. 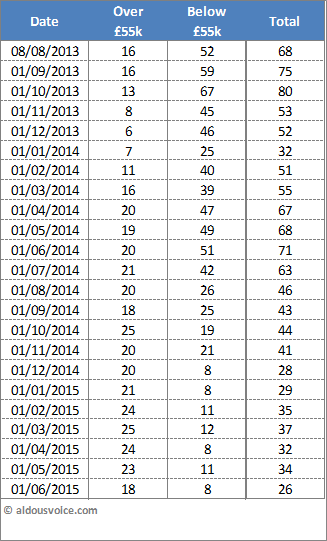 Here’s the table of asking prices for the different mileage points. I ended last months update with a warning for buyers and I’d like to reiterate it. Over the last month I’ve seen quite a few cars offered for sale that at best were hiding thousands in deferred maintenance and at worst shouldn’t have been on the road. Please be very careful! Hi. I just wanted to say great job on collecting this data and presenting it to us. I look forward to reading this every month. Great job! Another great article Aldous. I can’t help thinking that the world has gone a bit nuts though. 355 and 360 prices like this just take these cars out of reach for a whole bunch more people. I struggled to pay 52k for my 360 and the idea now that 6 years on it is worth 10-20k more is crazy. They are now running into the 430 car prices and to be honest the 430 is a much better car than the 360 and arguably miles better than the 355. Still I’m glad I sold my 360 when I did and just maybe hope that 430 prices go nuts too. Although I wonder if they may become the Porsche 996 of the Ferrari world. High production numbers and modernity make them unattractive long term. I still love mine though. How is yours? My 430 is going great thanks. I managed to put on 2k in Europe a couple of months ago and am taking it to Le Mans next week. I echo Joes comments, awesome job, please keep doing this, very interesting. I am a Brit living in Canada and own a 360. 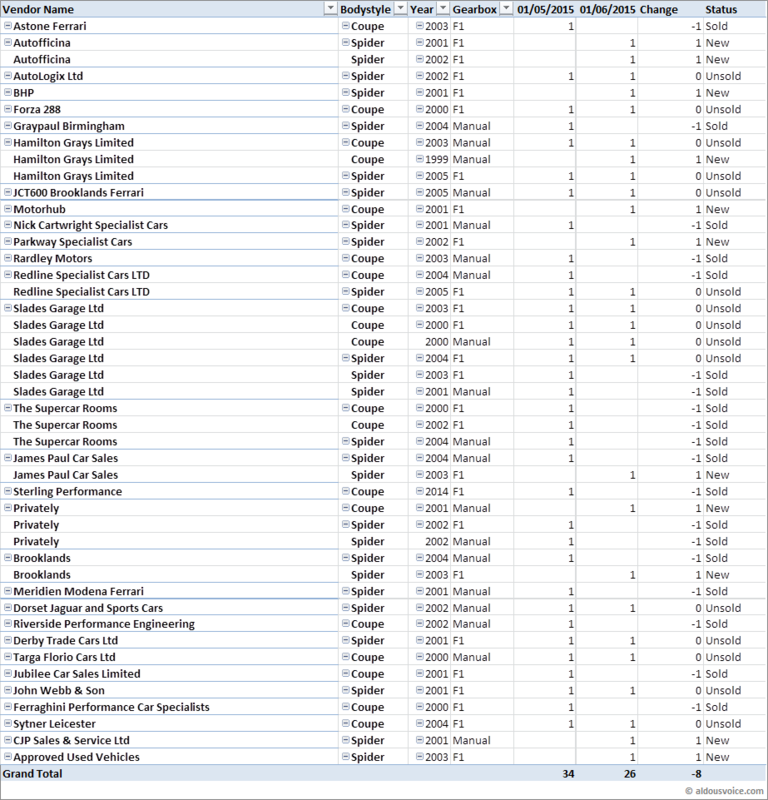 I would love to do the same thing for Canadian cars, would you share your spreadsheets and a how-to guide, and I would be happy to share my findings with you. Perhaps this could lead to a worldwide AV 360 index!?? Very interesting keep up the good work! Last month I picked up a 2001, 28k mile 360F1 in Italy for under £40k, FFSH. Just passed it’s MOT with flying colors. Still some bargains to be had in Europe whilst the Euro is so weak.